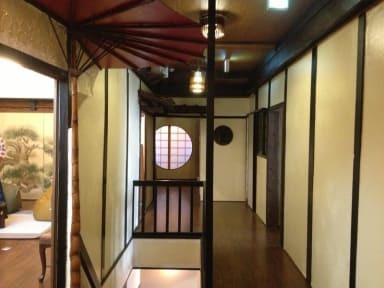 Guesthouse U-En, Osaka, Japonia : Rezerwuj teraz! Guesthouse U-En is located in a quiet, traditional area whilst still providing easy access to Umeda (Kita)'s happening bars. 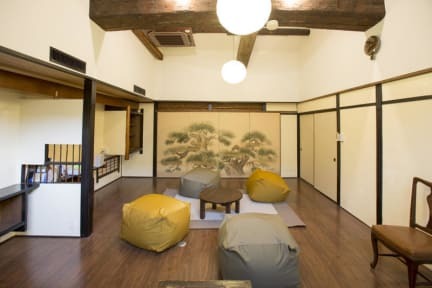 This 120-year-old townhouse has been lovingly restored into contemporary accommodation retaining its traditional Japanese. The hostel features a spacious shared living area containing a fully-equipped kitchen and comfortable lounge. Free Wi-Fi is available throughout the entire hostel. We are also able to provide you with a bike for 500 yen per day. Thanks to our pin controlled front entrance we are able to provide a secure environment without the need for a curfew. We invite you to relax in this historic building, enjoy a friendly, fun and intimate atmosphere, surf our top-of-the-range internet and make yourself at home! Cafe & bar restaurant is now open on the first floor serving home roasted coffee and some meals for the breakfast. *Please take a note our building as it’s an old wooden house has no enough sound proof, also does not have an elevator. Guests rooms are located on the 2nd floor. Our staff are happy to help you to carry your bags. All our facilities are on shared basis as we are designed with independent young travelers in mind. We are a hostel and not a hotel or Ryokan. *Luggage storage is available anytime between 8am and 10pm. Check in time is 3pm. *Our latest check in time is 10pm. No arrival is allowed after that. There is no curfew after checking in. If you are arriving at Kansai International airport after 8:30pm on your check in date, please book another place for the first night. *We are located in a small alley. Please bring an access description provided on the booking confirmation e-mai from Hostelworld or check our location on google map before arrival. 4 days before-:20%, 3 days before-:30%, 2 days before-:50%, the previous day-:80%, on the day&No show-:100% #In the case of No show, all reservations will be automatically canceled, and the price of total nights will be charged. #Please keep in mind that this is a small scale facility, so all cancellations are significant to us. You will be charged under any circumstances(Ex: transportation delay/cancel, bad weather). - Mixed dormitory room >Bunk bed (basic dorm) or Wooden pod bed (standard dorm). Bed is equipped with a security locker, shelf, bed lamp, power supply, mirror. - Female dormitory room >Bunk bed (basic dorm) or Wooden pod bed (standard dorm). Bed is equipped with a security locker, shelf, bed lamp, power supply, mirror. - Double room > 1 double size bed in the Japanese-style room. 6 square meters. - Economy Twin room > 2 single beds in the Japanese-style room. 10 square meters. - Standard Twin room > 2 bunk beds room (4 beds) .11 square meters (The same as Quad room). - Quad room > 2 bunk beds in the Japanese-style room. 11 square meters. The bed-sharing of adults is not acceptable. Please book one bed per one person. For kids under 15years of age, please read the following. Bed-sharing kids are welcome at the private rooms. JPY1000 will be charged per 1 child if they are 3 years of age and older. One bed-sharing kid is acceptable per one adult. Please note that it will be so tight for bed-sharing in Twin room and Double room. Groups of 7+ people can not book our hostel. Mixed dormitory room : groups of 7+ people can not book in this room.